Today was my third and final day tat VMworld! I cannot believe how quick this week has gone and how much I have had! Take a look at my VLOG summarising my day! This year I am extremely lucky enough to be out in Barcelona for VMworld 2018! Whilst there is so much going on, with announcements, hands on labs, product demos and of course meeting everyone within the community, I wanted to give myself a clear focus for the week and learn more about Workspace Transformation. Follow our director Barry Coombs as he attends the VMware Solution Summit in London on July 4th. You will see clips from the event and Barry's thoughts on the content from the day. I was lucky enough to be invited to the inaugural vRetreat event held at the Porsche experience centre at Silverstone UK. The vRetreat events aim to gather industry experts with industry vendors to discuss the technicalities of their products combined with a bit of fun for us all! The first sponsors of vRetreat were Cohesity, Zerto and Veeam. Bloggers present at this inaugural event were, Rynardt Spies, David Owen, Simon Gallagher, Amit Panchal, Michael Poore and I. 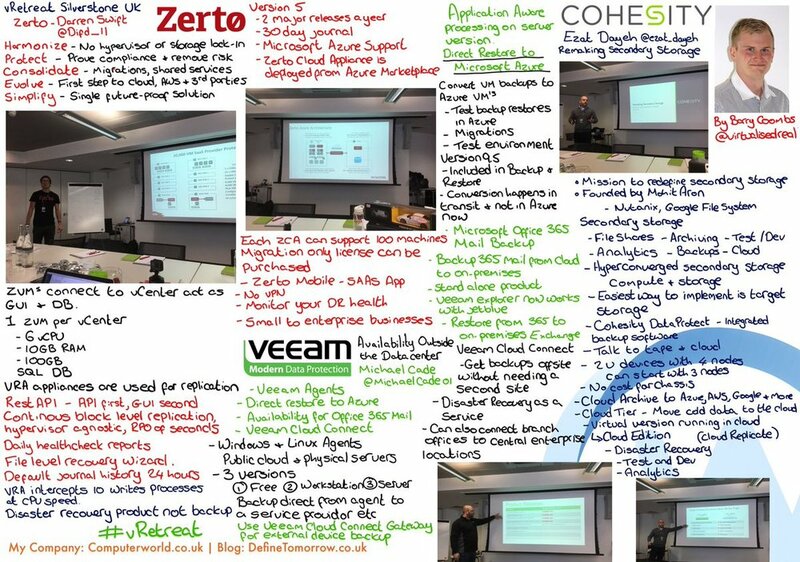 We were also joined by Joe Baguley (VMware CTO), Darren Swift (Zerto Principal SE EMEA), Ezat Dayeh (Senior SE Cohestity) and Michael Cade (Veeam -Technical Evangelist), vRetreat is the brainchild of Patrick Redknap. The Porsche Experience Centre is a purpose built facility alongside the Bristol F1 Grand Prix circuit Silverstone. It was designed to allow attendees to test the handling of Porsche's cars but to also gain valuable driving skills. The emphasise of the circuits is very much handling and control of the car and not all out speed. The day was split into two halves with the first half being a deep dive technical presentations and discussions with the sponsors. I intend to follow up with some specific information regarding Cohesity and Zerto but there were some common themes across the day. Whilst all vendors presenting had an offering that could be used in your data centre they also had offerings or functionality that would also work in or with the public cloud in some way. The hybrid cloud era is definitely upon us! Please see my video montage of the day below and also the doodle I completed on the day. Watch this space for more information from Zerto and Cohesity coming soon. The second half of the day was all about the cars, I personally had a session in the Porsche Caymen S and 911 Targa. My instructor gave me tuition on everything from handling to power delivery and breaking as well controlling the car in skid conditions! I think we all came away wanting a Porsche! Thankfully they didnt sell them their or I think we may have all come away out of pocket!!! Now we are in the middle of the summer and people are jetting off on holiday it seems that the news front has gone a little quiet. However, this hasn't stopped us summarising the biggest news of the week within tech into our fifth BizTech Brief. What can you expect at the Define Tomorrow™ event? In this short video ComputerWorld's vExpert and Operations Director Barry Coombs, talks about what you can expect at the Define Tomorrow™ event taking place in Bristol. ComputerWorld's annual VMworld update event is now bigger and better and ever and taking on the new brand of Define Tomorrow. In this short video learn more about are event and what the Define Tomorrow brand promises to bring. Don't miss this unique opportunity spaces are limited. Register Now! The Southwest's BIGGEST business technology conference. The world moves fast and only one business technology conference explores the latest from VMworld 2015 and beyond to help your business increase productivity, realise opportunities, overcome challenges, satisfy customers and keep one step ahead of the competition. Or in other words… Define Tomorrow™. Speakers will include senior managers from VMware, Dell and more (to be announced) together with our very own, industry-recognised vExpert Barry Coombs. You’ll have a chance to network with colleagues and our ComputerWorld specialist team will be on hand to offer help and advice on the big themes discussed.